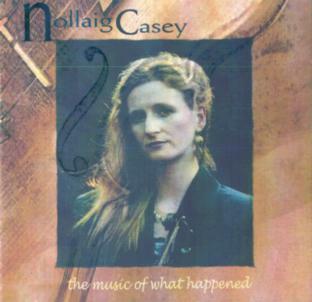 On this evidence, it is utterly strange that Irish fiddler Nollaig Casey has taken so long to release her own solo album. Sure, there have been the two she recorded with her husband, guitarist Arty McGlynn, and a starring role in Dónal Lunny’s Coolfin, plus buckets of session work, but this is the long-awaited genuine article. Much as she holds a deserved reputation as a traditional musician, remember that Nollaig began her career with a five-year stint as a member of the RTÉ Symphony Orchestra. This means that she sometimes uses techniques such as slurring and vibrato. Also, she’s never lacked a willingness to experiment, so it’s only marginally surprising that The Music of What Happened kicks off with Jota da Maia, a Galician tune learnt from Carlos Nuñez, and ends with Penguin Café Orchestra’s Music for a Found Harmonium (which Arty introduced to the tradition via Patrick Street). In between these musical bookends there’s a panoply of gorgeous singing and glorious fiddling. The latter’s zenith might well be the wonderful old harp melody from John and William Neal’s 1724 collection, Ye Clarges’ Lamentation, or possibly the elegiac, self-penned The Last Lord of Beara. Nollaig’s always been a fine player of jigs and there’s a splendidly rumbustious rendition of The Yellow Wattle adjacent to a gutsy set of reels where’s she’s joined by her sister and fellow-fiddler Mairéad. The four songs are solidly traditional and include the less well-known Cití na gCumann as well as a sumptuous reading of A Spailpín a Riúin and, perhaps, best of all, The Bonnie Blue-Eyed Lassie, from the repertoire of Elizabeth Cronin, where Arty proves the point that the simplest accompaniment is often the most effective. Indeed, as co-producer, Arty’s presence and musical vision are strong throughout The Music of What Happened, though the supporting cast (Sharon Shannon, Rod McVey and Liam Bradley) also plays its part fulsomely. Ultimately, however, this is Nollaig’s tour de force and fortifies her reputation as a thoroughly thrilling and outstanding musician. You’ll be kicking yourself for several years if you miss this one! On a final note, Old Bridge Music is, of course, co-owned by Nollaig’s other sister, the harper Máire Ní Chathasaigh, and guitarist Chris Newman. Lucky readers in Australia and New Zealand should not fail to miss the forthcoming September tour when Nollaig, Máire, Arty and Chris will be playing as a quartet. Click here for more information about Old Bridge Music.